Home Valuation and Appraisals Answer the Question: How Much Is Your Atlanta Home Really Worth? There is quite a difference in home valuation between the emotional value of a home and the economic value of a house. The word “home” has connotations of family holiday celebrations, family memories, safety, and security. The word “house” implies value, investment, and appreciation. In reality, a home is a house, and vice versa. And, there is no problem with blurring the lines between the two until you get ready to sell. Once you do choose to sell, the two values can start to conflict. Then, you have to step back and start thinking of your home as a house and home valuation becomes a financial calculation. Because we offer a free Market Analysis of your home as part of the English Team service commitment, I have met with hundreds of families who were considering the sale of their home. Many of these families were being forced to sell because of a job change, divorce, failing heath, or other unforeseen change in economic circumstances. At present many are facing adverse economic circumstances because of job loss combined with unfortunate mortgage commitments. Given the stress and anxiety attached created by unexpected events, these families have a great need to get the highest amount possible from the sale of their home. Unfortunately these circumstances usually lead them to latch onto any information with a positive effect on the market value of their home. Likewise, families tend to completely ignore information that might have a negative impact on the value. Herein lays the dilemma for real estate agents: Should I agree to list the home for an amount higher than the market analysis predicts the property will yield? Or, should I be honest and open with the sellers and make a realistic prediction of the property’s sales price? Putting an overvalued list price on the home virtually guarantees that the home will take much longer than average to sell. If the list price on the home is inflated, the home will eventually sell for less than the Market Analysis predicts it should have. How Can We Predict the Market Value of Your Home? The market value of your home is not a function of what you have invested in the home. Just as the price of a share of stock fluctuates up and down every day on the New York Stock Exchange, so too does the value of your home in the local marketplace. It does not matter what price you paid for the home. It does not matter what you have invested in remodeling or improving the home. In the end, the marketplace determines your home valuation. Sadly, it is not unheard of for homes to sell for less than the sum of the purchase price plus improvements. We are seeing this over and over in the present economic cycle. The market value / home valuation is not a function of what you need out of the house. I can’t tell you how many times people have told me that they have to price their home at a certain level because they want “x” amount of dollars from the sale of their current home to purchase a new house. Unfortunately, it just doesn’t work that way. The buyer doesn’t care how much money you need from the sale of your home and has made his decision independently of your need to purchase a replacement home. Likewise, the market value of your home is in no way connected to the price of homes where you are moving. Houses cost more in the Northeast and California, but this will in no way impact the price your home sells for in the Atlanta market. Finally, the market valuation of a home is in no way connected to the memories and experiences you have had in the home. Most homes would be priceless if this were true. Most folks already know what factors go in to the market valuation of their home. However, when it’s time to actually think about selling, emotions have a tendency to override rational thought and block out the things we don’t want to think about. One common argument for overpricing a home is the existence of an appraisal that says the home is worth a certain amount of dollars. Sellers completely ignore the fact that the appraisal was done for a specific reason at a specific time and reflects the value of a home a specific point in time. Remember: appraisals reflect the purpose for which they were initiated. If you have an appraisal from a lender, you have not been given the market price of your home; you have been given the upper limit of the lender’s willingness to loan you money. In particular, lenders have been overly generous in home valuations for the purpose of making equity lines of credit. We are seeing the consequences of that decision in today’s foreclosure rate. If you have an appraisal from a lender, you have not been given the market price of your home; you have been given the upper limit of the lender’s willingness to loan you money. In particular, lenders have been overly generous in home valuation for the purpose of making equity lines of credit. These appraisals are not measures of what the market says a buyer is willing to pay for your home. Bank appraisals instead reflect the risk a lender is willing to consider when underwriting your loan. If you instruct a qualified appraiser to predict the price your home will sell for in the next sixty days, you will obtain a pretty good estimate of what your home will yield on the market. But, if you have an outdated (older than 30 days), second party appraisal (i.e. bank, estate, tax, insurance) used for an entirely different purpose; you do not have an accurate prediction for the market value of your home. You do not have an updated home valuation, you have a historical document. Certified Professional Appraisers do an in depth analysis of your home and prepare a Uniform Residential Appraisal Report. The appraisal includes an inspection of your home, inside and out; a street map showing the exact location of comparable sales; sketch of the property with exterior dimensions; and photographs of the property. The report will include detailed information about the physical characteristics of the property, zoning classification and much more. 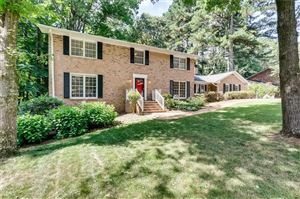 Do you need a referral to a competent and knowledgeable professional appraiser in Atlanta Georgia? If yes, give me a call at 404-229-2995 and I will provide you with contact information. Insurance values can be misleading indicators of a home’s true market worth. Insurance companies have a vested interest in making sure you can replace your home in the event of a fire or other disaster. The recommended insurance value of your home almost always exceeds the market valuation of your home. The Antiques Road Show on PBS cracks me up when they give owners of antiques two different values for their family heirloom. In reality, they are building in anticipated future appreciation when they assign a higher value for “insurance purposes” rather than the lower value for the antique heirloom “at auction.” The auction price is actually the “market” value. The tax office is also a poor source for the market value of your home. Despite an admirable effort to individualize the appraisal of your home for tax purposes, tax appraisers are looking at a huge database and have a limited amount of time when they assign a valuation to your home. In my experience, tax home valuations in metro Atlanta counties have – for the most part – been below the actual market value of the home. This is not 100% true, as I often receive requests from homeowners challenging an inflated valuation of their home by the tax office. In the present market, with rampant foreclosures, the exceptions have become almost a “norm”. How Much Is Your Atlanta Home Really Worth? Number One: The market value of your home is the price a buyer is willing to pay for your property today. A buyer makes his decision based on today’s market, today’s competition, today’s financing, and today’s economic conditions. Remember, these factors do change from day-to-day. Number Two: The market value of your home is based on a buyer’s perception of the condition of your property. Number Three: The market value of your home is based on the location of your home. (You knew this already…everybody knows the rule of “location, location, location”). Number Four: The market value of your home is based on a normal marketing time. Fire sales have lower-yielded market values than properly marketed sales. Auctions generally fetch a lower price than properly marketed sales. The challenge a you may face in accepting the reality of the market valuation of your home is that so many of the variables are not within the your control. Market conditions, the motivation of competition, and the actual “value” of the home as perceived by the buyer are generally beyond the seller’s control. In the end, the only factors of market valuation a seller can control are the condition of the property, access to the property, and the asking price. Everything else is determined by the market. Who Can Determine Market Value? No one person can determine what the market will price a home. We can make predictions based on good information, analyze the competition, and review recent sales information for comparable properties. A Comparative Market Analysis (also known as a CMA) will look closely at what “comparable” homes in your immediate neighborhood have sold for and then consider the differences between your home and the homes that have sold. CMAs are performed by licensed professional Realtors. CMAs use a data base, generally the local multiple listing service (aka MLS) which contains detailed information about recent sales, pending sales and homes that are presently listed for sale. CMAs focus primarily on recent home sales. Realtors look closely at the location of the comparable home, the date of the sale, the sales price, any special circumstances with impact on the sales price (example: foreclosures), condition of the property sold and the property’s physical characteristics. The physical differences between the homes sold in your immediate neighborhood and your home will be considered in the form of price adjustments. If a comparable home sale has a basement and yours does not, then a deduction in price will be made to your homes “market value”. If your home has a sun room and the comparable home sale does not. The lack of a sun room in the comparable sale will be acknowledged in the form of a deduction to the sales price of the comparable home. These adjustments are made until the point where the two homes are on a “level” playing field. This is how the estimate of the market value of your home is determined. The CMA is an estimate of the value of your home if sold in the present market conditions. In the end, we are all subject to the marketplace as the sole “appraiser” of our homes and houses.